Help is available on eBay, but to be fair, the people at eBay Customer Service are pretty busy. The eBay Customer Service team has millions of customers. many of whom are asking questions and wanting help at the same time. If you stick to the eBay Help area and — in the most extreme cases, such as your pictures not showing up in search — use the Contact Us link on the eBay home page, you should be able to get the help you need on eBay. When you click Contact Us, you land on the Customer Service page. Type your question into the text box provided and then click the Ask button. 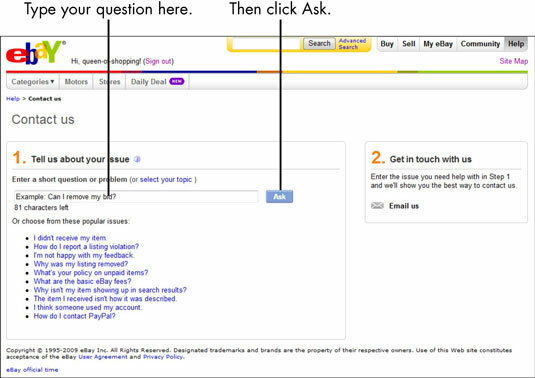 Fill in any other information that eBay asks regarding your question and then click Submit. 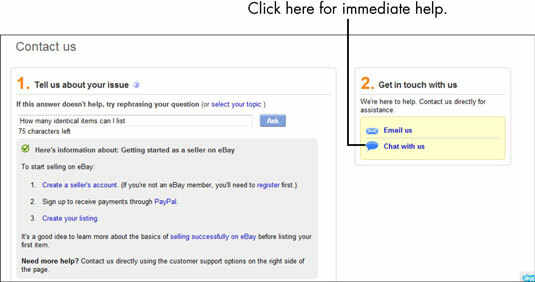 eBay may present an answer to your question, or the online auction site may not have a clue to the answer. You will then be asked to click the Email Us or Chat with Us link to get a real person to answer your questions. When you click Chat With Us, you want immediate assistance. 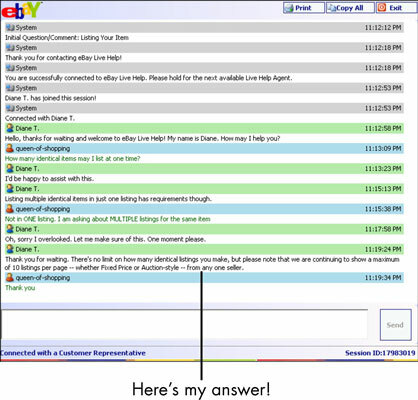 eBay does have chat boards with people willing to be helpful, but as in the real world, people may not be giving out accurate information. They may also have something to sell.